Durable, cozy, or both? 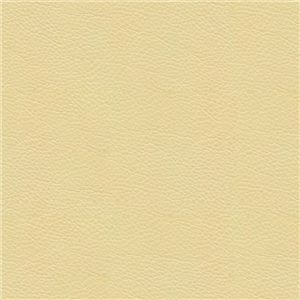 No matter the demands of your household, we've got a solid body fabric or durable choice of Elements QC performance fabric or leather match that works for you. Come into the store to see and touch the cover options in person before you make your final decision on your custom recliner covering. Hand-picked by you, custom made for you. Sink into the enveloping comfort of these memory foam cushions, inspired by the contouring properties of memory foam mattresses. The memory foam lays right next to the fabric for the ultimate softness, with a high-resiliency foam cushion underneath for long-lasting durability. Place the recliner a bit closer to the wall and easily reserve some extra space for moving around your room. 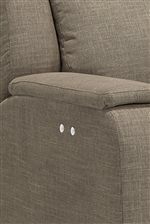 This model of wall-saver recliner can be placed as close as two inches from the wall to recline safely. Like a brand new mattress, this exceptional reclining loveseat uses memory foam technology to create the ultimate, sink-in space to relax in your home. Enveloping foam cushions you while you recline into your seat, making it that much easier to enjoy movie night, the big game, or watching the kids.The loveseat has a sleek and modern design that looks great in any any room, from a modestly sized apartment living room to a basement family room or home theater. 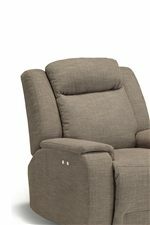 Available with space saver or rocking mechanism, in power and manual recline. The Hardisty Power Space Saver Reclining Loveseat with Cupholder and Storage Console by Best Home Furnishings at Best Home Furnishings in the St. Louis, Chesterfield, St. Charles, MO & Waterloo, Belleville, Edwardsville, IL area. Product availability may vary. Contact us for the most current availability on this product. 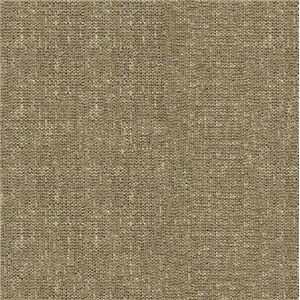 Fabric Options Available in over 700 different fabric, leather and color styles. You love mattresses and pillows with sink-in memory foam. Now you can get this innovative feature of cutting-edge comfort technology on your recliner and sofa as well! The Hardisty collection is a remarkable reclining furniture collection for the modern home, offering you modestly-sized pieces with top-of-the-line memory foam cushions and an effortlessly sleek look. Choose the reclining sofa, chair, loveseat, or storage console loveseat for your space, and opt for infinite-position power recline to bring furniture comfort to the max. Hardisty is the cool and casual reclining furniture you've been looking for, perfect for your family room, home theater, or even the living room. The Hardisty collection is a great option if you are looking for Casual furniture in the St. Louis, Chesterfield, St. Charles, MO & Waterloo, Belleville, Edwardsville, IL area. Browse other items in the Hardisty collection from Best Home Furnishings in the St. Louis, Chesterfield, St. Charles, MO & Waterloo, Belleville, Edwardsville, IL area.